Uglyworld #599 - World Cup Fever (161-365), originally uploaded by www.bazpics.com. 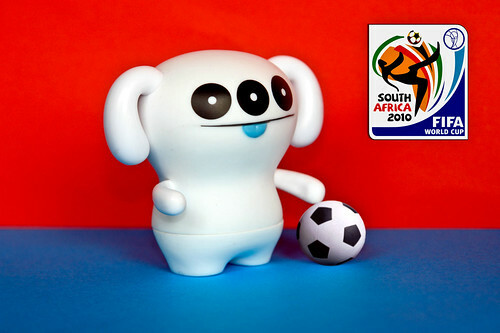 Tomorrow afternoon the 2010 World Cup will kick off with host nation South Africa taking on Mexico, and the uglies are all getting into the world cup fever that seems to be taking over almost everywhere we go at the moment. Peaco has spent the entire day so far dribbling his football up and down the living room, and keeps shouting "checks this outs" as he's managed to teach himself yet another new trick or move. The second game tomorrow features Uruguay against France, and Peaco says he tips Urugay for that one - when asked why he chose Urugay he replies "Your-A-Guy, you tells me!". His humour appears to be coming on as quickly as his football (soccer for our colonial cousins) skills.